House of Brides was established in 1929 and has been the shopping destination for engaged women and their bridal parties. In 2016, House of Brides changed its name to House of Brides Couture and introduced The Couture Experience with a new focus on upscale and personalized wedding dress shopping. "We are providing our clients the ultimate in selection and service with The Couture Experience." For 87 years, House of Brides has been a Chicagoland institution and celebrated as the oldest bridal name in the United States. The bridal retailer has dressed millions of brides and their wedding parties from around the world. House of Brides’ dedication to providing the finest selection of wedding dresses, bridesmaid dresses and special event apparel has made them a trusted name in the bridal industry. A fundamental factor in House of Brides success and longevity is their adaptability in an ever-changing business. In recent years, brides have been seeking a more Couture atmosphere. Industry experts point to the popularity of wedding shopping themed shows such as Say Yes to the Dress and My Fair Wedding with David Tutera within the last decade. House of Brides’ marketing team took notice and began a strategy to provide the same to its clientele. 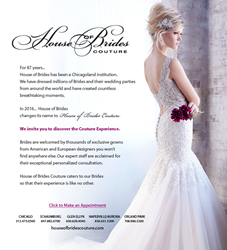 In 2016, House of Brides changed it name to House of Brides Couture and launched its new website, houseofbridescouture.com. Along with the name, House of Brides Couture announced The Couture Experience. The bridal retailer is focused on the clientele’s visit to its stores. House of Brides Couture has brought in thousands of upper-end wedding dresses from American and European designers, many of which are exclusive to House of Brides Couture. The retailer boasts the largest selection of Couture bridal gowns and bridesmaid dresses in Chicagoland. Another component to The Couture Experience is one-on-one professional consultation by their wedding experts. Customers work with a personal consultant who guides the customer from the selection of the dress to the day she picks-up the gown for her wedding day. House of Brides Couture’s launch is coupled with the expansion of the brand and locations, renovations of our stores, enhanced visibility on social media, improvement of sales strategies and a keener eye on its inventories. House of Brides Couture' salon locations include Chicago, Schaumburg, Glen Ellyn, Naperville/ Aurora and Orland Park. The salons are open 7 days by appointment.